Posted on July 17, 2013 by Eric A. We have added a new Signature item that can be added to your form. 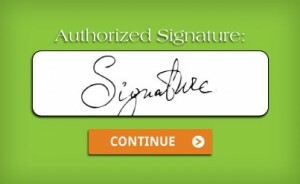 You can now capture electronic signatures on forms by allowing visitors to sign with their mouse, finger, or stylus. This will help you to verify your users’ identities or allow your users to provide an extra layer of consent to your forms. The Signature item will generate an image of the electronic signature that you can view with your results, depending on the format. For example, you will see these inline with the rest of the form results in most email formats. They can also be downloaded along with your Attachment item results. Please Contact Support with any feedback, comments, or suggestions. Posted on April 2, 2013 by Eric A. 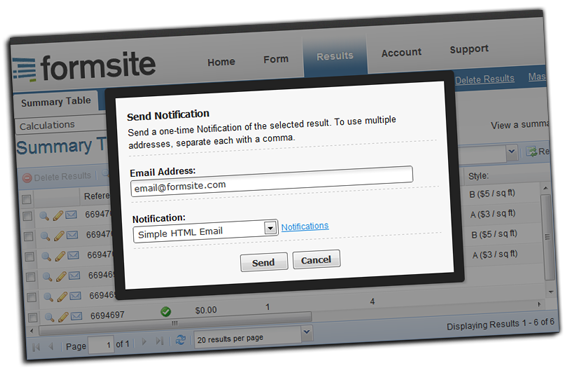 We have added the ability to jump right into an instant demo of Formsite.com with just the push of a button. 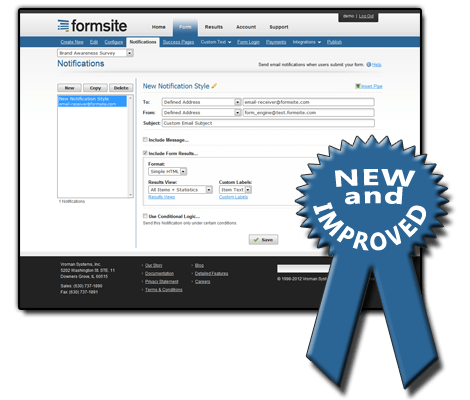 Click this to preview a Formsite account and try out our celebrated form builder and other great features. 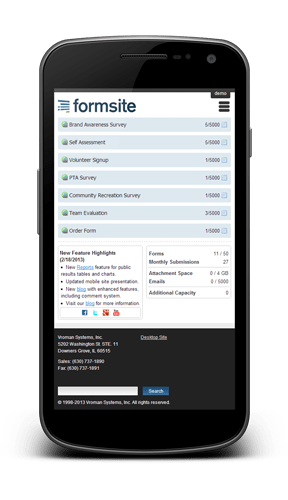 This lets you use a temporary account to see everything Formsite has to offer. When you’re ready, you can simply sign up from inside of this account to keep it as your own, along with any forms or results contained within. You can also sign up for a regular account, including a free 14-day trial of the Pro 1 level of service, HERE. Posted on February 14, 2013 by Eric A. We have added a new option when signing up for a new account: Pro Trial. 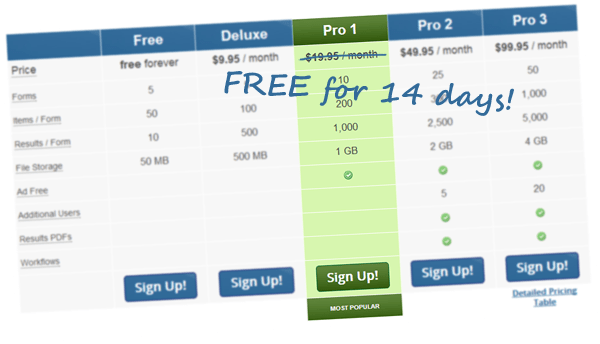 This is a complimentary 14-day trial of Pro 1, our most popular level of service. There are no commitments and no obligation to renew. The trial lasts for 14 days. You are free to upgrade to a paid level of service at any time, letting you keep access to all of the features and limits of the Pro level. 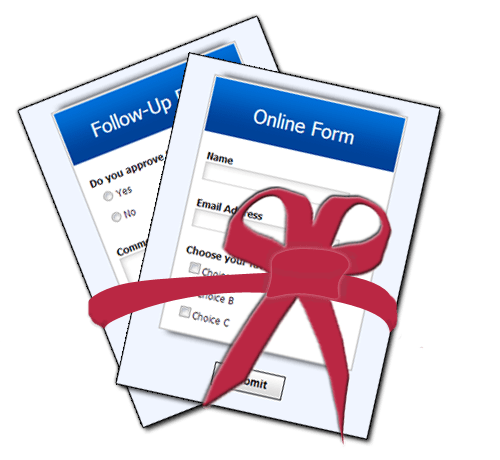 If the trial completes and you choose not to upgrade or renew, your account will simply revert back to the Free level of service, leaving your forms and results intact. 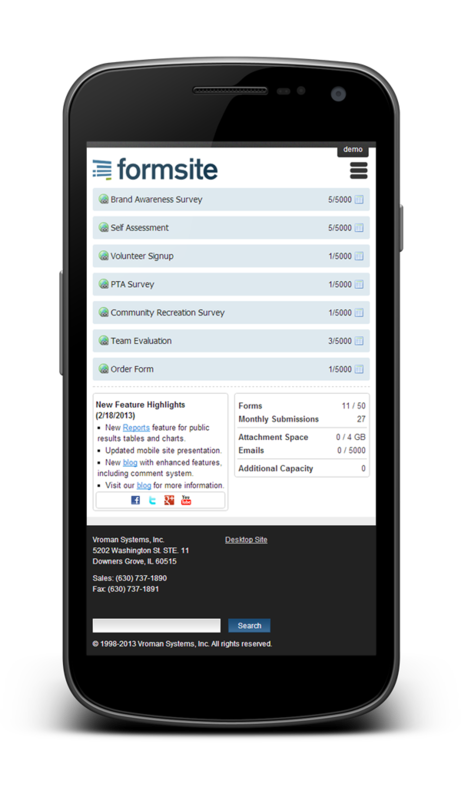 If you have not tried Formsite yet, Sign Up for a new account today and take advantage of the new Pro Trial option! We have added a new mobile-friendly presentation option. You will see this by default after logging in on a smartphone or other mobile device. The mobile-friendly presentation gives a more concise view of your forms on the Home page. The Publish page has also been updated to make it easier to get links to your forms as well as share them on Facebook and Twitter. Updates on the Summary Table allow you to easily and quickly view your results on a small-screened device. In addition to offering a more streamlined experience, the new mobile presentation also helps pages load faster and conserve mobile data usage. If you would like, you can also still get back to the regular “desktop” view at any time. Sign Up or Login to try it out! Posted on November 28, 2012 by Eric A. Have you ever wanted to relate two or more forms together? With our new Workflow feature, you can! In addition to simply tying two or more forms together, Workflows also allow you to implement very complex and powerful logic. 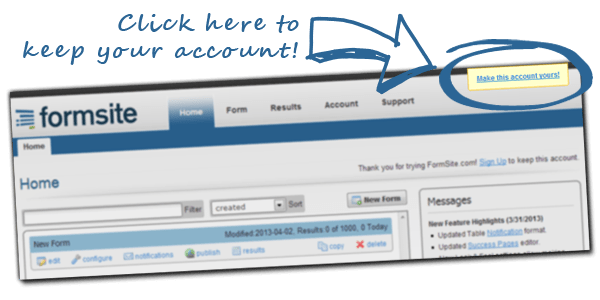 With an optional Form Mapping, you can easily carry users’ responses through multiple forms as well. Posted on October 22, 2012 by Eric A. Our Google Spreadsheets Integration has been updated to provide extra convenience and security, courtesy of Google’s newest OAuth 2.0 authentication. To take advantage of this, simply visit the “Form->Integrations->Google Spreadsheets” page, click “Get Token”, and follow the prompts. Posted on May 6, 2012 by Eric A. In addition to being able to send a custom email of current results from the Results Table, you can now also send Notifications. Posted on February 1, 2012 by Eric A. 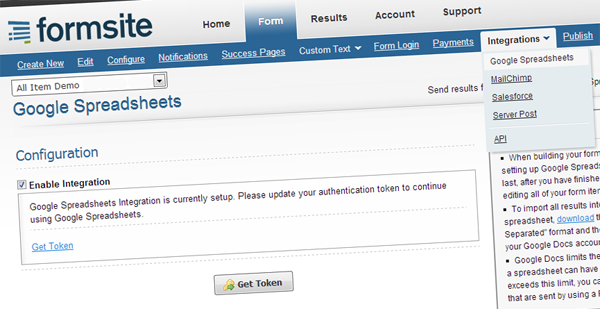 One of our most popular features is Notifications, which can send out emails when a form is submitted. As such, we often add new features or functionality to Notifications. You can’t argue with that, right? Well, the downside is that over time, our once clean-and-simple design for its settings page ballooned out a little bit, and we felt it got in the way of using all those great new features.